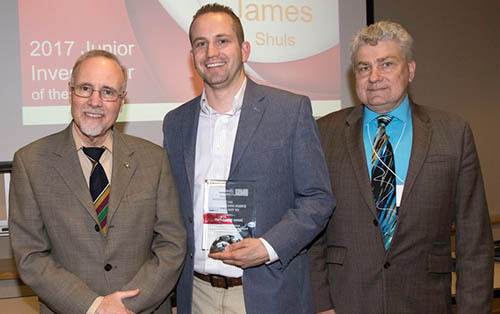 Chancellor Tom George, left, of the University of Missouri-St. Louis and Chris Spilling, right, interim vice provost for graduate studies and research, present the 2017 Junior Investigator of the Year award to James Shuls, an assistant professor of educational leadership and policy studies. James Shuls, a 2013 graduate of the University of Arkansas, received the 2017 Junior Investigator of the Year award from the University of Missouri-St. Louis, where Shuls teaches and conducts research. Shuls was honored for his research into the public school retirement system of Missouri. He is an assistant professor of educational leadership and policy studies and teaches in the Department of Educator Preparation, Innovation and Research in the UMSL College of Education. He earned a doctorate in education policy from the U of A and was a Doctoral Academy Fellow. The initial funding for Shuls’ research came from a University of Missouri Research Board grant for $13,757, according to a news release from the university. His results and publications earned him an additional $30,000 grant from the Charles Koch Foundation to continue and extend his research.